Die cutting is our specialty. With a range of automatic as well as hand-fed manual machines we are able to run small and large quantities. We can cut a range of materials, including: paper, fibre board, corrugated cardboard, plastic, leather, mdf, film, and more. Used in combination with our other processes and capabilities, die cutting can create simple boxes, as well as complex folding patterns to bring anything to life. Mounting involves Â laminating two, or more layered papers/carboard sheets together. The most common use is to mount printed sheet to a selected size or grain of corrugated or fibre board, before it is die cut. 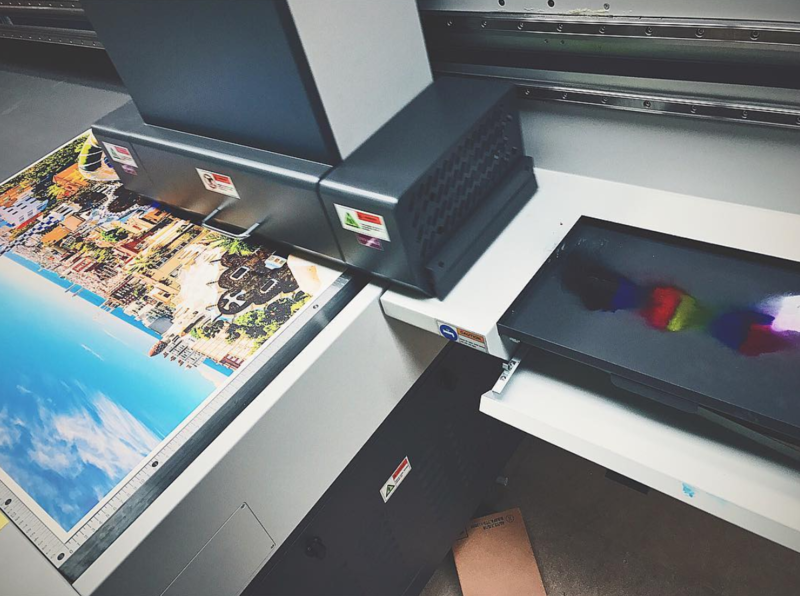 This process is often overlooked when designing, but is involved in most production jobs in order to get the high quality print onto a more rigid material. Crash-lock cartons are often used to produce a box or tray that can be sent out flat and then be opened and popped out in-store without anyÂ extra assembly. Our experienced and creative designers work closely with our clients to create innovative and functional pieces. Our professional sample maker can produce a sample to enable you to visualise the finished product. This allows approvals or modifications to be made quickly and easily. It also ensures that your job is compliant and correct prior to production, resulting in a smoother work flow. Our flatbed UV LED Digital wide-format printer is our latest toy. We can print onto anything (almost), and our creative juices are flowing. Celloglazing involves adhering a film to the outside of paper or cardboard. It is often used for stylistic effect, but also adds durability to the product. The film itself comes in a range of different styles. Most commonly, either gloss, or matt finish. See our tech specs page for more details on what we can produce for you. Our window patching machine allows us to adhere a plastic film over a cut-out on your package, creating a window for the product to be seen through. Our skilled knife-makers can handcraft simple shapes through to more complex designs. We accept existing knifelines in most electronic formats including PDF and EPS. We are also able to create a knife from an existing sample.The benefit of having an in-house knife-maker allows knives to be altered whilst on the machine with minimal fuss. This ensures that if there are any modifications required, it will not affect your deadlines.